When Gavrillo Princip took his pistol, FN Model 1910 and shoot twice towards Archduke Franz Ferdinand on 28th June 1914 he didn't realize that this was the start of biggest and bloodiest war in human history. War which in fact ended in 1945 and changed the world forever. 16 million people died in four years of fights with another 50 million victims of influenza epidemic as a aftermath. The very last veteran of war was Florence Green, a British citizen who served in the Allied armed forces, and who died 4 February 2012, aged 110. We now have only artifacts, which remind us of worst war in history. 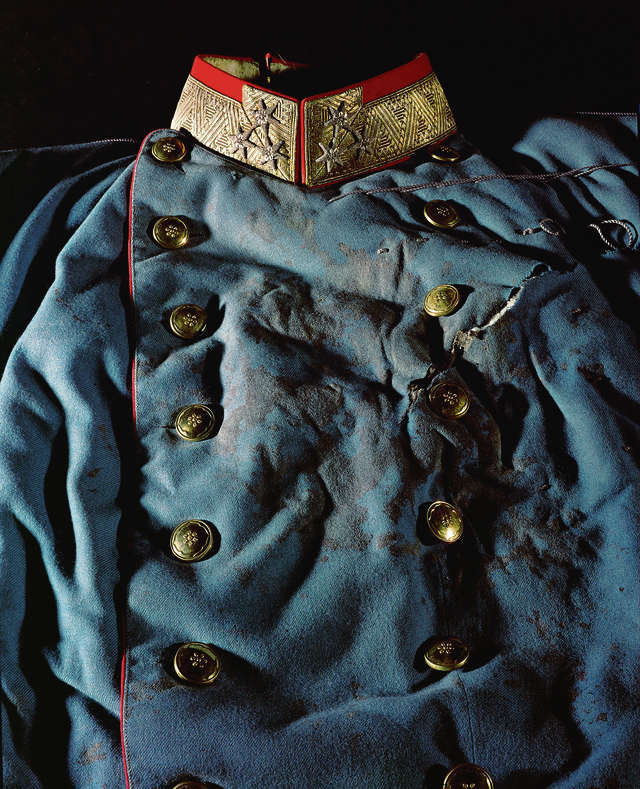 The bloodstained coat of the Archduke Franz Ferdinand. Sarajevo, 1914. The first bullet wounded the Archduke in the jugular vein, the second inflicted an abdominal wound on the Duchess. Both victims remained seated upright, but died while being driven to the Governor's residence for medical treatment. As reported by Count Harrach, Franz Ferdinand's last words were "Sophie, Sophie! Don't die! Live for our children!" followed by six or seven utterances of "It is nothing," in response to Harrach's inquiry as to Franz Ferdinand's injury. These utterances were followed by a long death rattle. Sophie was dead on arrival at the Governor's residence. Franz Ferdinand died 10 minutes later. 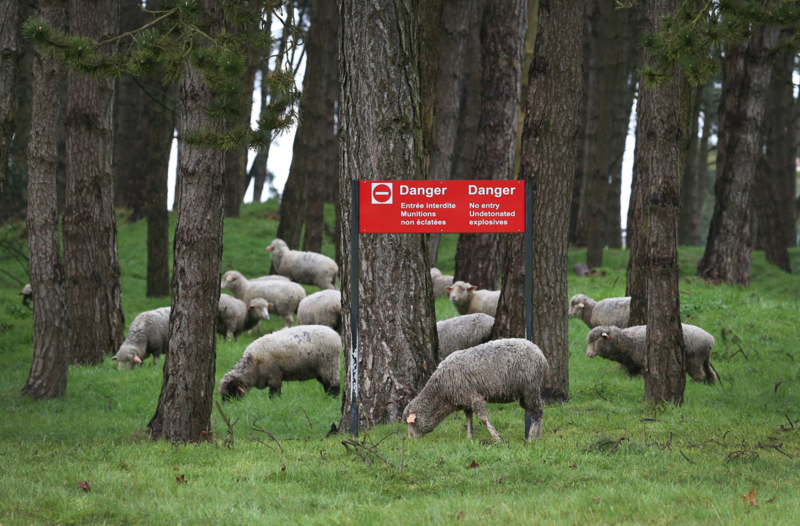 Sheep graze in an area still dangerous from unexploded World War One munitions at the Canadian National Vimy Memorial. It is estimated that during 4 years of fights more than 500 million shells were fired by artilery. Each year special units are recovering several tons of unexploded ammunition in France and Belgium. 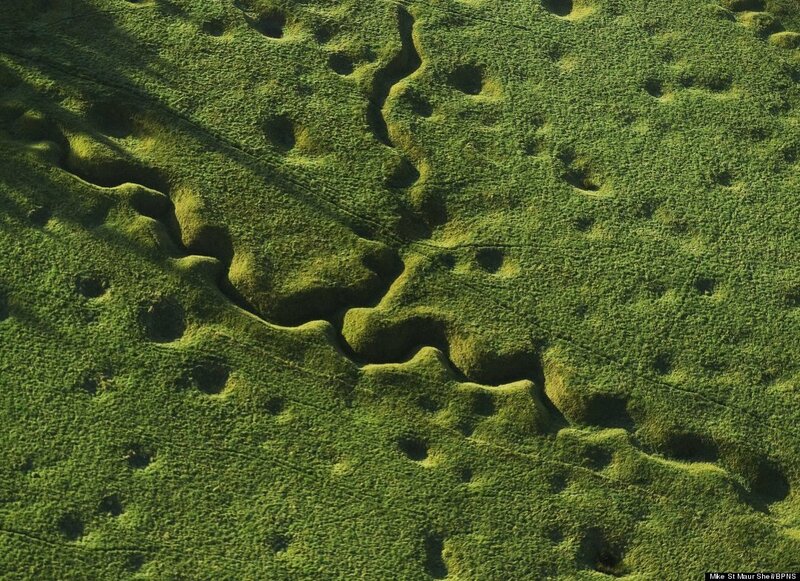 The still pockmarked landscape of Somme battlefield. It was the biggest and bloodiest battle of Great War with more than one million death toll. 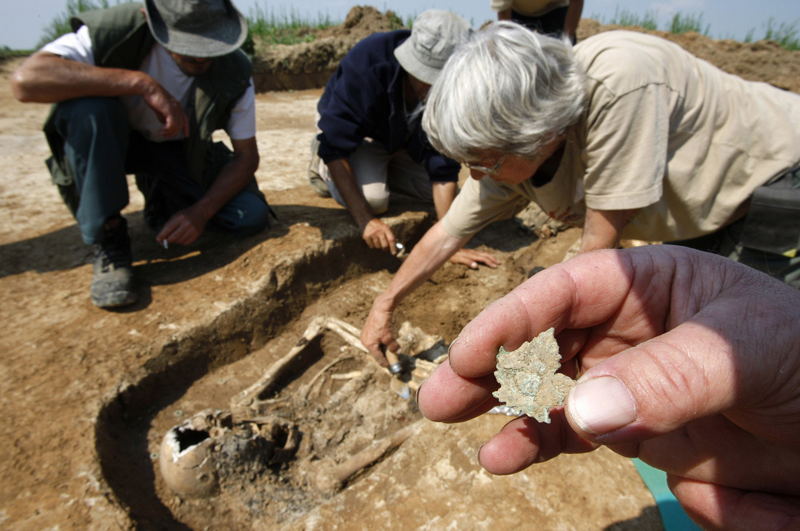 A member Commonwealth War Graves Commission displays a maple leaf, an army jacket emblem, found on the remains of a Canadian soldier by archaeologists in the city of Sancourt near Cambrai in northern France, on June 9, 2008. The soldier, who participated in the battle of Cambrai, fought from September to October 1918, was part of the 78th Winnipeg Battalion of Manitoba, part of the 4th Canadian Division. 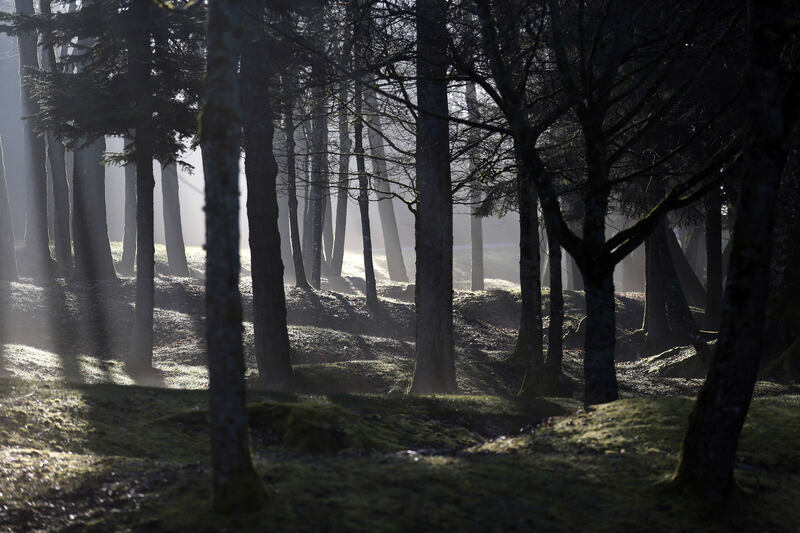 Trees stand where the village of Fleury once stood, near Verdun, on March 5, 2014. A hundred years after the guns fell silent in World War One, nine villages wiped out by fighting on France's bloodiest battleground continue to lead a ghostly existence. Their names still appear on maps and in government records. Mayors representing them are designated by local authorities. But most of the streets, shops, houses and people who once lived around the French army stronghold of Verdun are gone. Lochnagar crater. On 1 July 1916, the first day of the Battle of the Somme, 16 tons of ammonal were detonated. It had obliterated between 300 and 400 feet (91 and 122 metres) of the German dug-outs, all said to have been full of German troops. 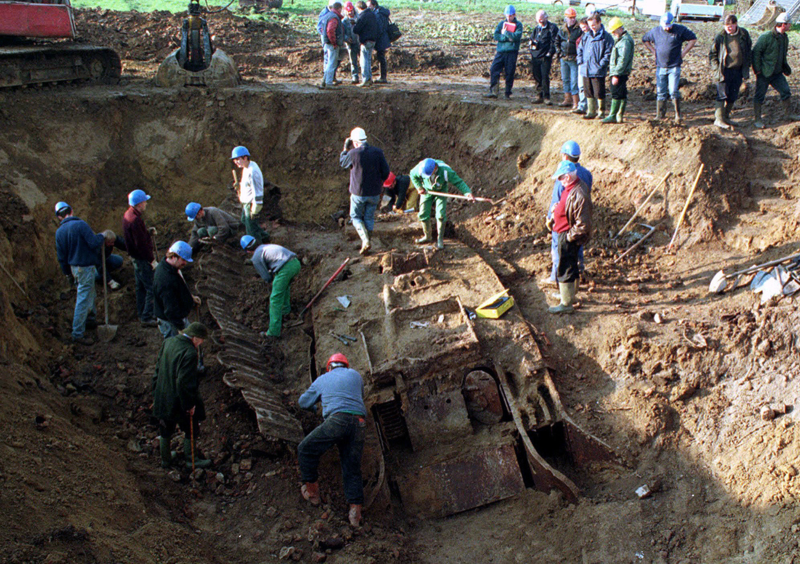 Archeological workers unearth a British WWI Mark IV tank in Flesquieres, near Cambrai in northern France, on November 19, 1998. 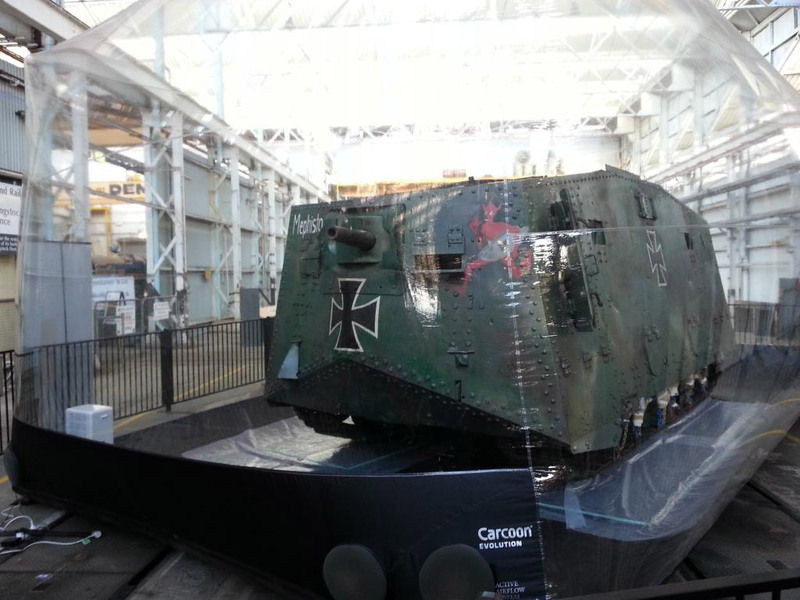 British troops abandoned the tank on November 20, 1917, and German troops then buried it and used it as a bunker. 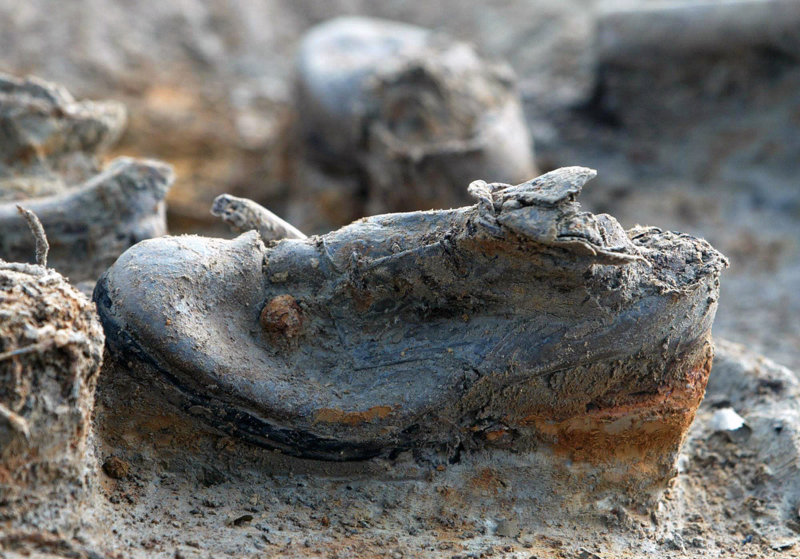 A pair of shoes, believed to belong to a British soldier, have been excavated from a trench dated from the World War I near the Belgian city of Ypres on the Western Front November 10, 2003. Belgian archaeologists, aided by British military experts, found remains of soldiers as well as weapons and other objects. 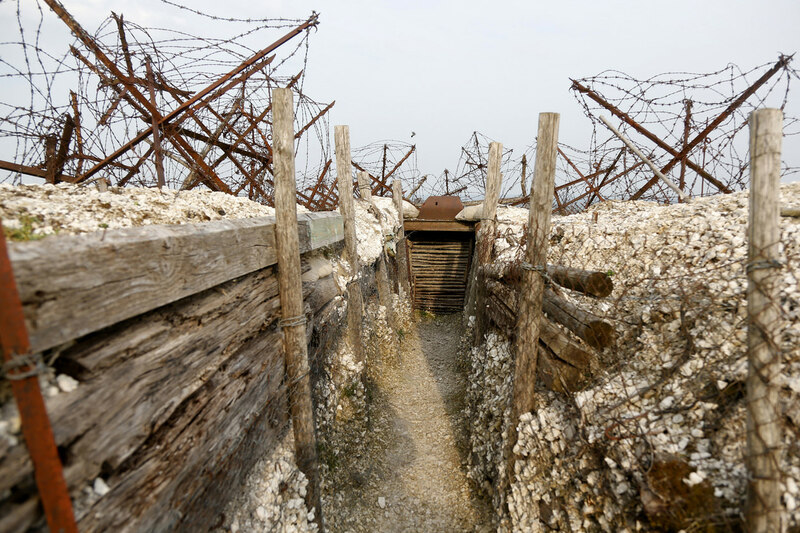 Inside view of a WWI trench at Massiges, northeastern France, on March 28, 2014. During the war, the battlefield between the Champagne and Argonne fronts was taken and lost several times by French and German troops between September 1914 and September 1915. During trench restoration works, in the last two years, the Main de Massiges Association has found seven bodies of WWI soldiers. 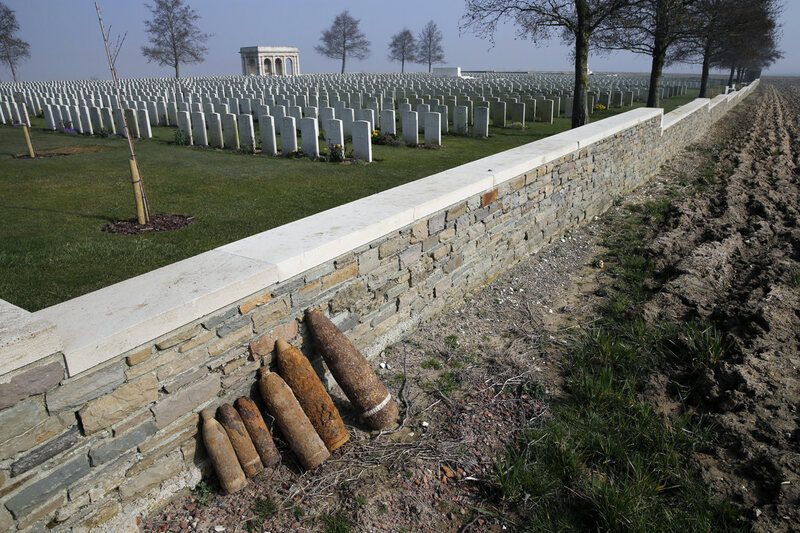 Remains of unidentified soldiers at the ossuary of Douaumont, eastern France, on February 9, 2014. 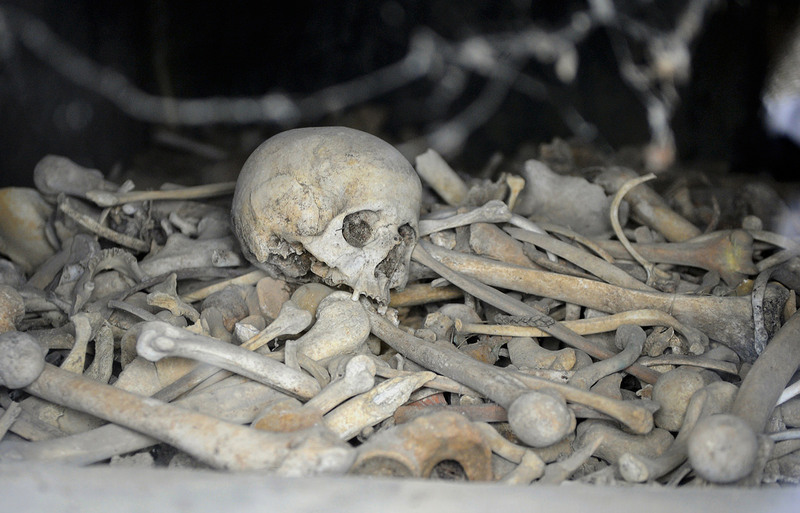 The ossuary holds the remains of 130,000 unidentified French and German soldiers who died in the battle of Verdun. 700 000 casualties in 20 square kilemeters of battlefield. 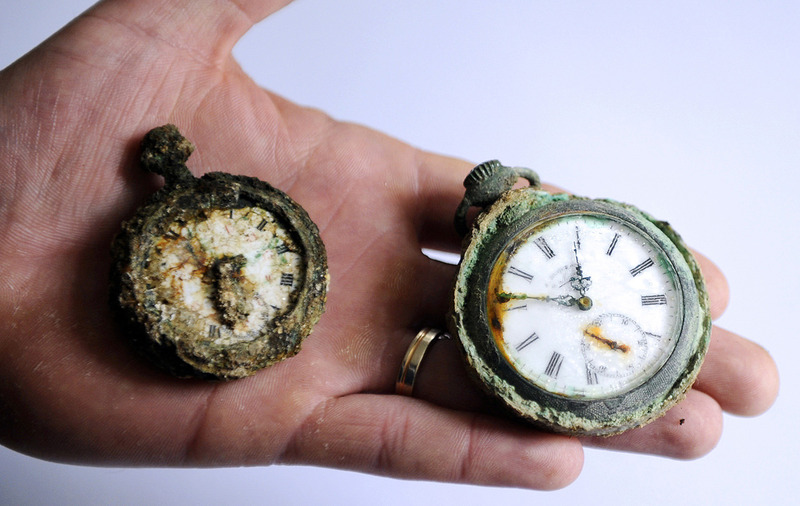 atches found with the remains of French WW1 soldiers, on June 3, 2013 in Verdun, France. At least 26 bodies of French soldiers were found in the cellar of a farm in the totally destroyed village of Fleury-devant-Douaumont. Seven were identified by their military identification plate. 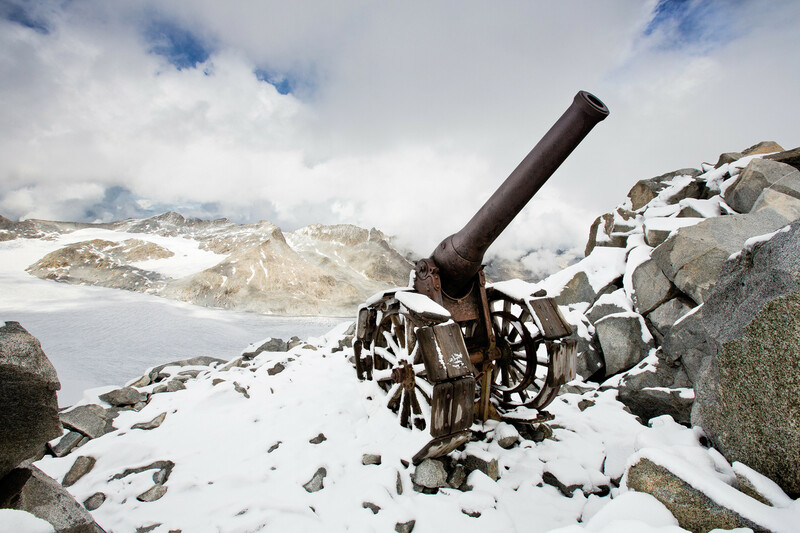 A vestige of alpine warfare, an Italian cannon still stands on Cresta Croce, a 3,000-meter-high Adamello ridge, WWI. Fights in Alps were extremly dangerous due to severe cold and avalanches. AuLion Trench Knife, I World War. Fights in trenches had more in common with medieval battles. Due to short distances and lack of space, knives, clubs and swords were more effective than pistols. 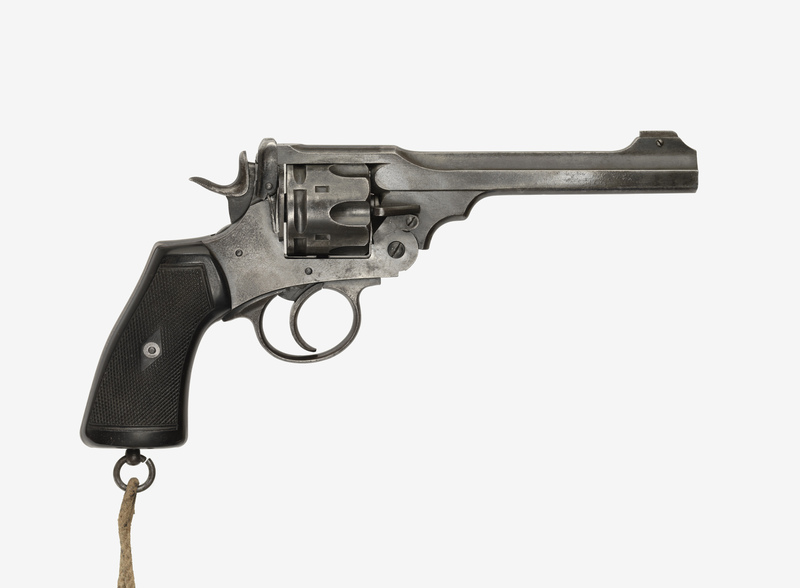 Webley .455 Mark 6 revolver belonging to J.R.R. Tolkien, First World War, 1916-1918. 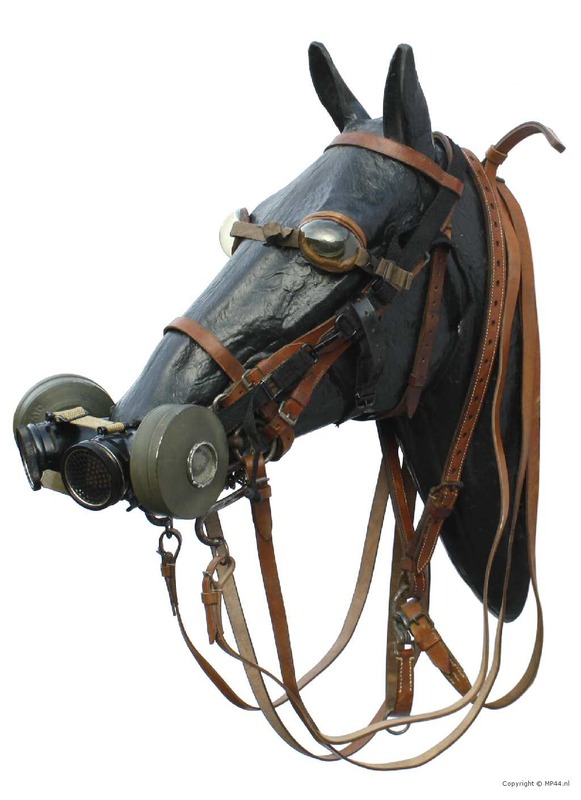 WWl Horse's gas mask, found at a German equipment dump in Rozières, France, in August 1918 by the British Army. It is estimated than more than million horses died during war, while surviving ones were sent to slaughterhouses to fill food needs. An aerial view shows Canadian National Vimy Memorial on Vimy Ridge, northern France March 20, 2014, the scars of craters and trenches still visible. This memorial site is dedicated to the memory of Canadian Expeditionary Force members killed during the First World War. Though the events of World War I have now fallen out of living memory, the remnants remain -- scarred landscapes, thousands of memorials, artifacts preserved in museums, photographs, and the stories passed down through the years -- stories of such tremendous loss. More than 65 million soldiers were mobilized by more than 30 nations, with battles taking place around the world. Industrialization brought modern weapons, machinery, and tactics to warfare, vastly increasing the killing power of armies. Battlefield conditions were horrific, typified by the chaotic, cratered hellscape of the Western Front, where soldiers in muddy trenches faced bullets, bombs, gas, bayonet charges, and more. Never again. Near the shore of Tollense river, few kilometers from modern Polish-Germany border archeologist have found signs of enormous battle that was fought 3300 years ago. Which is really surprising as we were sure that 3 millenia ago this region was on the outskirts of ancient civilizations, habited only by small, primitive groups. However newest excavations showed that more than 2000 killometers from borders of greek civilizations biggest battle of bronze age took place, way bigger than fights between greek polis. In the region where you can only expect small skirmishes between villages we now know that the battle was pan european. Examinations of skeletons proved (by DNA research) that warriors came to fight and die from whole Europe - modern Italy, Poland, Scandinavia, Greece. We only know one huge conflict from that times - halfmythic war of Troy, which was probably held in modern Turkey. To show how important Tollense battle was we need to compare it to the biggest battle of middle ages: Grunwald Battle, which took place in 1410 AD and was fought by aprox. 50-100k knights, with result of 16k deaths. Excavations on Grunwald fields are taking place for 50 years and as for now we have found skeletons of 200 warriors, 10 crossbow bolts, 6 fragments of armoured gloves, few remains of sword and one axe. In Tollense, after excavations 5-10% of battlefield archeologists (450sqm) found few thousand skeletal remains of at least 130 warriors, remains of 5 horses and huge amount of clubs, spears. Region of Tollense was ruled 1000 years before battle by unique Unietyce culture, which created amazing Nebra Sky Disc, which is one of the first ever maps of sky, with sun, moon and stars (it might have been a bronze age calendar), predating other (Babylonian) sky maps by 1000 years. We don't know which culture lived in Tollense region when the battle took place. 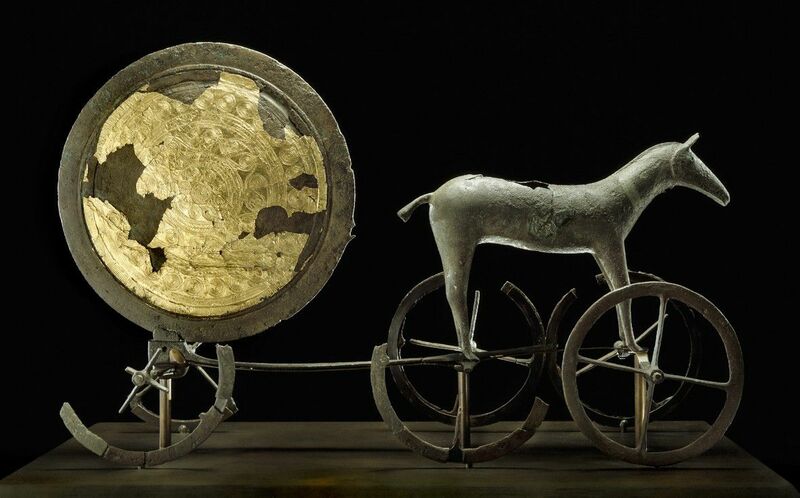 Probably it was the nordic culture responsible for crafting Sun Charriot of Trundholm, 1600 BC. 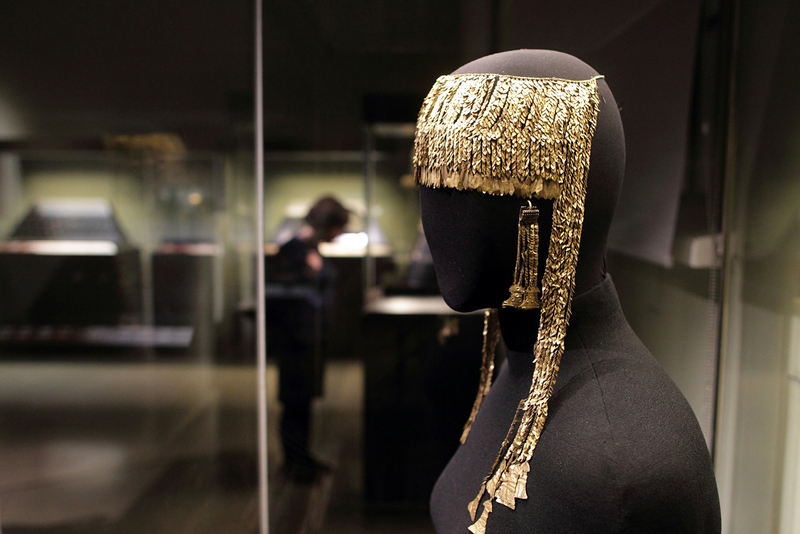 Artefacts found on the battlefield can be connected to both cultures: Unietyce (2200-1600 BC) and Nordic/Lusatian (1300-400BC). Unietyce culture introduced central Europe into Bronze Age, as the north and east of continent was still in stone age. Unietyce rapidly grew due to effective mining of crucial for Bronze Age tin and copper. This cuture was expanding in south-north route directions, by Odra river. Why? Because the trade route of amber and tin was extremly important for south Europe. So as we know that the warriors of Tollense battle came from whole continent, the battle was definately more important than local skirmish. Quick look at regionalsituation in 1300/1200 BC will help us understand importance of the battle. Before (1300BC) the battle of Tollense, the Indus Valley civilization collapsed, which was the biggest civilization of those times. At the same time the Lusatian culture started to expand. Then the battle of Tollense took place. After (1200BC) the battle ancient world was shocked by Late Bronze Age collapse, when Hetite, Egypt, Mykenis suddenly collapsed and went into dark ages for centuries. We believe that the mysterious People of the Sea were responsible for collapses. So knowing that the warriors of Tollense came from mediterranean area and it political situation was very dynamic, we might suppose that the battle was directly connected with Late Bronze Age collapse. Especially by the fact that all of the fallen cultures were previously trading with Tollense region cultures. Pomerania, where the battle took place was the starting point for amber trade route. Fallen empires were on the main consumers of products of north. Batlic amber was recenty found insyrian Quatna royal tombs, Cyprus and on on the mummy of king Tut. Tollense battlefield is located on the shore of the big river, newest excavations showed that there was also a bridge there. It must have been a border battle, where one of the sides tried to stop the second from crossing the river. But from crossing in which direction? Events 2000 years later than the Tollense battle can show us more hints. In 9th century AD mighty nordic Vikings started to expand into central Europe. However they were stopped by Slavs in Pomeranian region. After that, they changed expansions directions into west and east of Europe. They conqured Russia, South Italy and England. Their invasions had significant influence in middle ages history - the Vikings started Norman dynasty in England, expelled Byzantium from south of Italy etc. In result Vikings changed Europe and started processes that caused end of middle ages. So how about the same scenario 2000 years earlier? We don't know much about myserious organized groups that were able to create two armies. We only know that their expansion changed ancient Europe. Their migration (from north!) was a result of climate change. So what if the Tollense battle had impact on direction of expansion? What if the battle saved central Europe and inflicted collapse of south part of continent? Unfortunately we do not have many archeologic proves from that times. However there are several clues that can show us that central Europe, Baltic Sea area was not as we think of it. 1. German bishop Adam from Bremen in 1080 AD wrote about the biggest city in Europe. Located on the delta of Odra river to the Baltic Sea. City was called Jumne where Slavs, Barbarians and Greeks lived together. So when in 1000 AD we had there greek traders and in 1250BC Italian warriors - was the legendary city real? We can be almost sure that delta of Odra was really important through millenias. Arab trader (and in fact spy for Callif Al-Hakam II) Ibrahin ibn Jakub also wrote that the west Pomeranian region was important and wealthy. Local ruler - Mieszko, even gave a camel as a gift to German Emperor Otto III. So knowing this we have another hint, that the region was far more advanced than we currently think. And we know that each culture does not emerge from zero, but come by processes and previous cultures. Fun fact: Ibn Jakub writes also that few hundred kilometer east from Jumne there is a small only-women culture which is specialised in wars and trade. In modern times, in Mazury region (200 km from Odra river) there is a Frombork city, which name came from german Frauenburg, meaning City of Women. 2. Baltic origin of Troy. In 1995 Felice Vinci wrote a book which is extremly interesting with comparison to modern archeology findings. Baltic origins of Homers Epic Tales states that the mythic battle of Troy and long journey of Oddyseus did not took place in Anatolia and Greek coasts but in fact way further north - on North and Baltic Sea. When we look deeper into Oddysey and Illiad the descriptions of places, the climate does not fit to the regions of South Europe. His thesis states that Greeks, which won over Trojans are in fact nordic people. And the Troy was not located as thought in Turkey but somewhere near Baltic Sea. For example Ogygia island, where Oddyseus was trapped for 7 years during his journey is located (according to Plutarch) 5 days of sailing from England. Homer stated that Ogygia island was cold, snowy and often foggy, where the sun in summer does not go down completly. The sea there is always dark and grey. So this island cannot be located on Mediterranean Sea, where snow does not fall, fogs are rare and the sun goes down every part of the year. You can fit the tales more accurately with Faroe Island, north of Denmark. Cold climate and sun position fits way better there than 2500km south. Even the name one of the islands - Føroyar can be devided into oyar (plurar of oy, in old faroese language meaning island). In modern faroeses language island means oyggj, which is quiet simiar to Homer's Ōgygíē. One of the Faroe Islands is called Mykines, which shows simmilarities with greek language. Even the general name of people from Homer Tales: Achaeans /Danaans shows interesting connections. Oddyseus was a hero of Dannans, where Homer states that they have created Mycenaean culture. However there are no proves that the greeks from Mycenaean culture called themselves in that way. Only Hyttite empire informs of Ahhiyawa people that came from the sea and attacked minor Asia and Cyprus (Ahhiyawa=Acheans?). Achilles, Achean hero was bragging in Illiad that he plundered 23 cities. So maybe Achaeans were not local greeks but the famous people of the Sea that emiggrated into south Europe? 3. But the real Troy was found! In Hisarlik, Schliemann have found remains of walls, which he believed were the remains of ancient Troy. Yes, in fact the city was destroyed in 1250 AD. However his findings were controversial as he was famous for making shows instead of real excavations. Also the Homer's description of Troy does not fit with excavations. Hisarlik remains does not have geothermal water as descripted in Illiad, however Baltic region of Odra (especially Wolin Island) does. Newest excavations showed that the Hisarlik city was destroyed by earthquake and not by war. Even the famous Priam's treasure is 1000 years older than the battle of Troy. So the doubts about location of real Troy are rising. The Hisarlik was a important city, but not the hero of Homer Tales. 4. Tin as a source of Troy War. Every day brings additional discoveries which changes our views over ancient north Europe. Maybe the Tollense Battle was in fact a base for the Homer myths? It is worth noting that until our times only a small part of original Homer Tales survived. What if Tollense was biggest battle between Danaans (invaders) and Trojans (local groups)? There are more clues showing that only in central and north Europe there were cultures able to create and supply huge armies. Cultures of South were slowly collapsing (it is always a process), which ended with dark ages. What about north? The answer can be found in most important material of those times: bronze. Bronze, which was crucial for weapons making. Bronze is made by a mix of copper and tin. As there are plenty of copper deposists in whole Europe, the problem starts with tin. In Tollense excavations the most significant findings were inglots of pure tin. The tin was more important than gold, was extremly precious as it was a source of power. Even Homer writes that tin was very important for both of sides. It was a strategic resource. Julius Cezar have invaded Britain only to control tin deposist in Cornwall. So where the tin was mined? 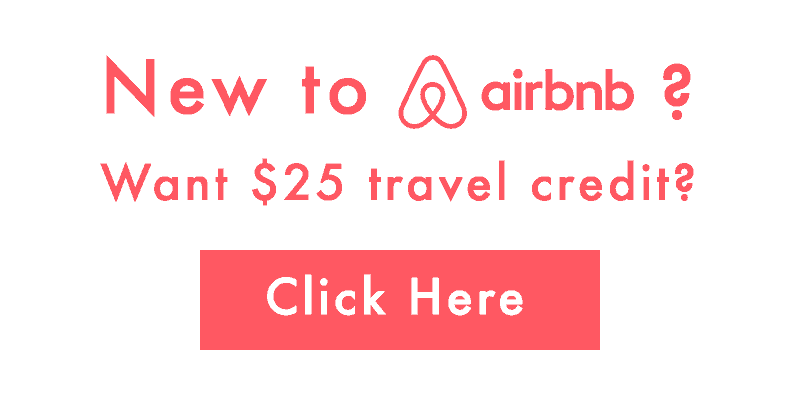 Not in south Europe, there only one minor deposit in Italy. Most of deposits can be found on far north. First mining of tin in north Europe started in 2500 BC in Rudawy Region, modern Germany. About 100km east, in Poland archeologists have found remains of biggest mettalurgical center from 1600 BC (Bruszczewo). So knowing that the Tollense battle area was famous for their tin deposists and mettalurgical processing center, why not connect it with Troyan war? We have tin, climate fitting Illiad and we have biggest battle of that times in one area. 5. Don't forget about amber. Homer states that the grand chamber of Menelaos Palace was made out of amber. In fact amber was second most important resource of that times, still more worth than gold. And the Baltic's amber was the most precious. With it's unique level of succinic acid was desirabled in whole ancient world. It was found in ancient Egypt, Mesopotamia and whole greek world. In greek myths Argonauts were sailing thru Erydan river to find Golden Fleece. On the end of their journey they found island of Electrum. Erydan was the name of river which the Baltic was before it changed into sea. Elektrum is another name for amber in Greek. The golden fleece legend tells also about siblings Helle and Fryksos, that have run away from their step-mother Ino on golden ram. Helle, while running away slipped of the ram and drowned. The sea was named after her (Helles Ponte). In modern times on the shore of Baltic we have towns with surprisingly names like Hel, Helsinki, Helblag (currently Elblag). Now that Helles Pont is considered to be located in Dardanelle, near Turkey. However Homer Talles states that Helles Ponte was wide, huge. Look on the map. Maybe Baltic is a Helles Ponte? We know that the Baltic Sea was not on outskirts of ancient world. The region was a greatest supplier and major player in ancient economy. So the reasons why the biggest ancient battle took place there seems more clear. Yes, quiet simillar to the Nebra Sky Disk. Even the materials of which the disk is made fits. Even if the Nebra Sky disk is older than Trojan war, the culture that created it, was really fluent in astrologhy and methallurgy. So yet another connection between Troy and Tollense. We don't know who were they. The only other source of Troyan war was a letter from Hettite emperor adressed to brother of Ahhiyawa king. In Illiad, Troy is also named as Ilion/Willion. So the Ilion was turkish Husarlik or maybe somwhere else? Troyan Land is also the name of pagan cultures that worshiped three-head god called Trojan. The god Trojan was a major part of slavic believes from Balkans, Pomerania up to Russia. Main region of Trojan worshipping was area of modern Szczecin, 30km from Baltic, just at the end of Odra River. So really close to Tollense. Trojan symbol was a block horse, one of Troyan pagan people tradition was building a wooden, black horse to sacrifice it. Looks familiar. So maybe, people of Troyan were all connected by a belief in might god Trojan, and their high interactions built a wealthy and important region that controlled tin deposits and amber route. However they were not able to unify and built a civilization, but remained as small groups joining together in case of external danger. So in fact, the Tollense battle could have been a war to control treasures of amber and tin. There is no other reason that 3300 years ago, two giant armies fought on the shore of river 2500km from ancient civilizations. Oddysey and Illiad might be a story of war of resources between local warlords and invaders from other parts of europe. Maybee result of the battle changed ancient Europe, destroyed the north-south trade and started processes that ended first civilizations of south europe. As we have researched only up to 10% of battlefield more surprising results will come. Also the archology in the region is still behind, there might be new surprisies. Thousands of bone fragments belonging to a very large number of persons have been discovered along with further corroborating evidence of battle; current estimates indicate that perhaps 4,000 warriors fought in a battle on the site in the 13th century BC. Since the population density then was about 5 people per square kilometer, this would have been the most significant battle in Bronze Age. Most of these remains were those of young men between the ages of 20 and 40. At one spot, 1,478 bones were found within just 12 sq. m. - maybe the remnant of a heap of corpses or of a final pocket of resistance. As no clear traces of healing have been found on any of the wounds, the whole encounter seems to have taken place in not much more than a day. 26% of skeletons "show signs of healed traumas from earlier fights, including three skulls with healed fractures", so many trained and experienced warriors seem to have taken part. Spears, clubs, swords, knives, sickles and arrows were used. Several of the more than 40 found skulls show signs of battle wounds. A bronze arrowhead was found in one of them. Contrasting such arrowheads with ones made from flint and with wooden clubs, it has been surmised that two differently-equipped groups confronted each other. At least some of the combatants rode into battle as evidenced by horse bones (of at least five specimens) found on site. The arrowhead's position in the initially found humerus bone shows that an archer on foot wounded a horseman. The fact that almost no material finds were made between the bones except for single arrowheads, suggests that the corpses were robbed after the fight. The victors probably threw the dead into the river, which carried them downstream, given the fact that most remains are no longer in anatomical connection. They were then deposited in a calmer part of the river, covered by turf and thereby partially conserved. It has been speculated that a better-armed group from the South or West wanted to cross the river on their way north- or eastwards on a strategic, long-established causeway. This road might well have been used for long-distance trade in tin and luxury goods (like e.g. the pearls from the Persian Gulf, found near Halle, or the Mediterranean glass pearls found close to nearby Neustrelitz; both finds from 1200 BC). The battle seems to coincide with a period of heightened militancy 3250 years ago, as metal became increascingly scarce north of the Alps and populations seem to have moved. When Holy Roman Emperor Charles V wanted to look faboulous and dangerous at once, he always asked Filippo Negroli, milenasian master of armors. 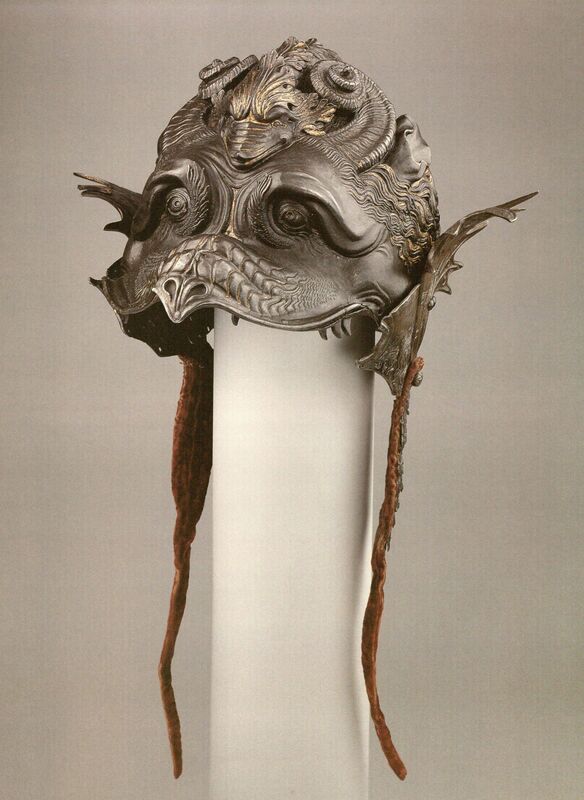 Filippo lived in 16th century and he was known as best and most skilled armorer in history. With the help of his brothers and cousins at their Milanese family workshop, Negroli outfitted the bigwigs of the Holy Roman Empire and the French and Spanish royal courts in incredible style. His elaborately embellished gauntlets, breastplates, shields, and helmets incorporated mythological figures like griffins, mermaids, and Medusa, as well as designs based on the art of ancient Rome. 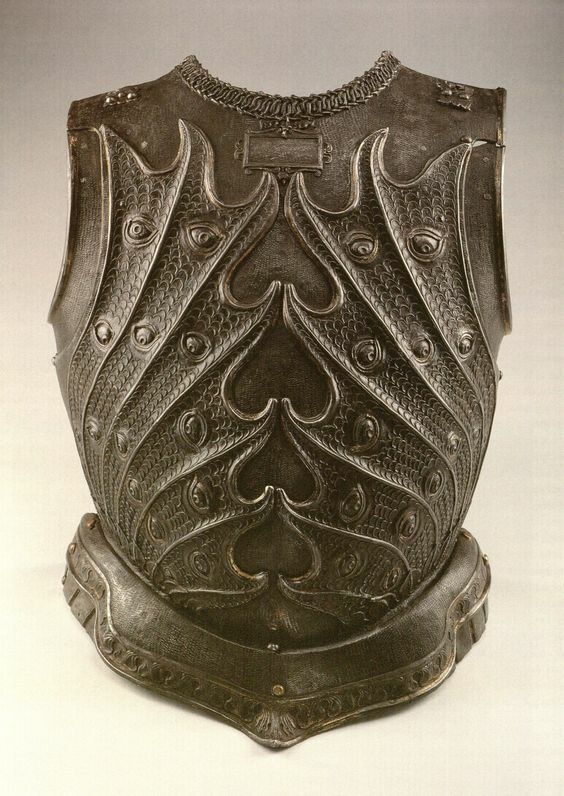 In addition to protecting internal organs from a forcefully aimed rapier or halberd, these pieces of armor played a symbolic role, transforming their wearers into the guise of the heroes of ancient history, mythology, or literature. 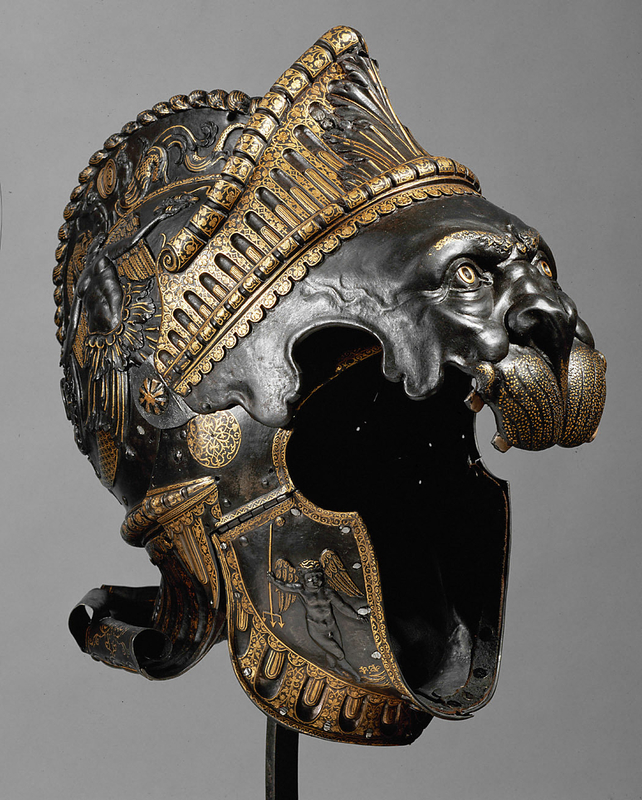 The helmets were intended for Renaissance princes who were often educated in the classics. These highly self-assured individuals “saw themselves as successors to the great statesmen and generals of ancient Rome. Among the most impressive creations Negroli’s armory sent forth were the burgonets: military helmets characterized by a prominent peak and a comb or crest that runs all the way from the forehead to the base of the neck. The artisans at the Negroli armory were fans of depicting figures reclining across the combs of helmets. Negroli’s satisfied customers included Holy Roman Emperor Charles V, and French rulers Francis I and Henry II. Charles V was a frequent client, and didn’t always go in for all the mythology stuff—in some cases, the man was the myth. 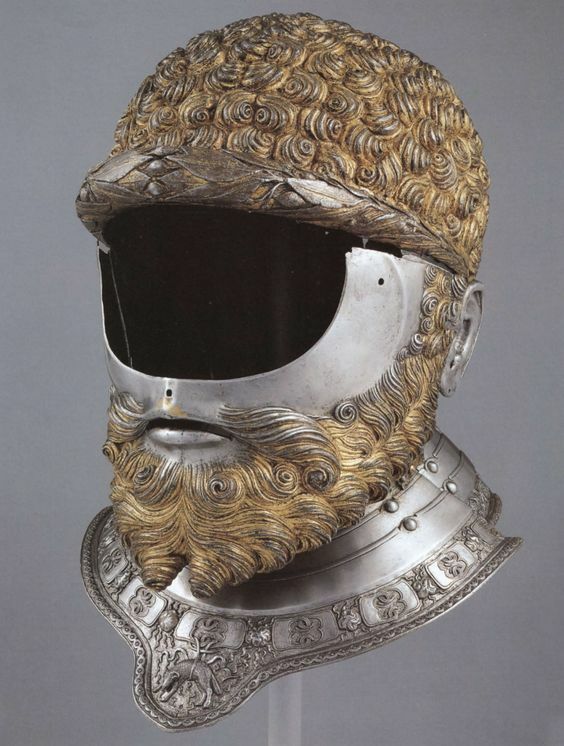 Negroli made a parade helmet for the emperor that incorporated Charles V’s own golden hair and beard into the design, resulting in him putting on armor that made him look like a steel version of himself. 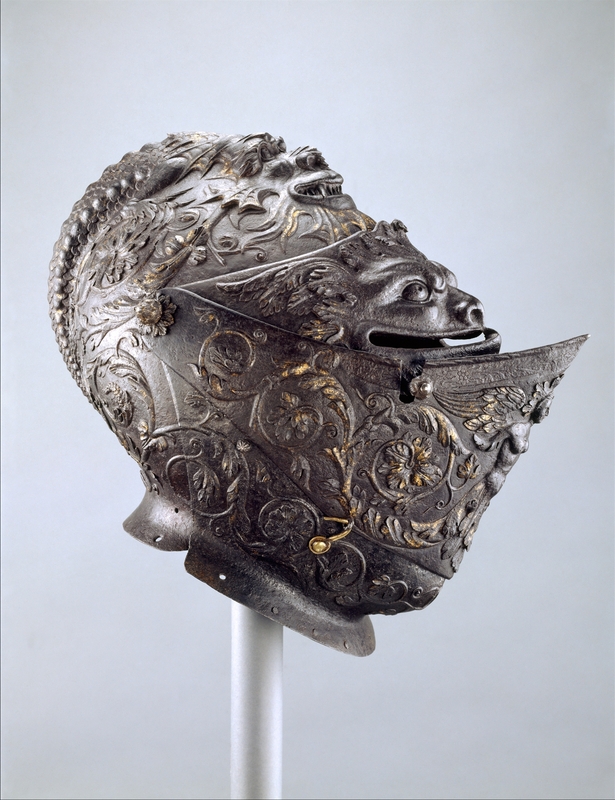 Filippo was specialized in repoussé of armour, whereas his brother Francesco was renowned for his damascening skills. 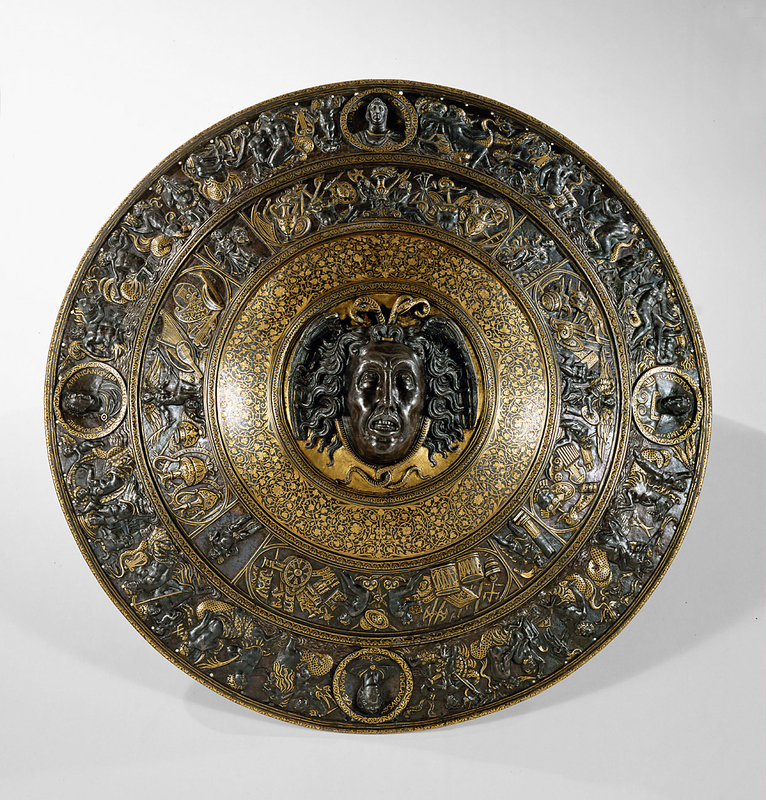 Filippo's pieces are considered especially remarkable because they were wrought in steel, rather than the more-easily worked iron that was the traditionally assumed medium.